Real ID California: How many people have already upgraded? 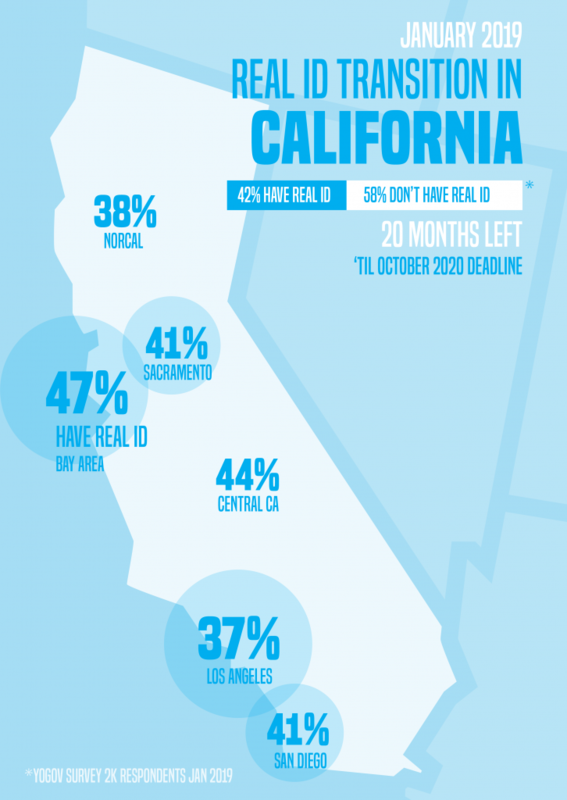 We’re releasing our first Real ID survey results for California residents today. Whether you have upgraded your driver’s license to the new federal requirement yet or not, this survey shows you that whatever camp you're in, you’re not alone. Based on our survey, only 42% of our California users have upgraded to their Real ID, so nearly 60% still need to do so. The Bay Area has the highest percentage of people who've upgraded (47%) and the Los Angeles area has the lowest percentage (37%). However, these percentages are far higher than the California population as a whole. Many of our respondents have already used us for DMV-related services, including to get their Real ID. In fact, many people in California still don’t know what the Real ID is and that it is required by Fall 2020. Be sure to get the word out to friends, family, and coworkers whenever you have the opportunity to make the transition as smooth as possible for the state and its residents. Because you want to avoid being caught the great Real ID panic of 2020. We anticipate that tens of millions of Californians will avoid upgrading until the last minute, which means the already-months-long waits for DMV appointments could get long, the wait times once at the DMV could increase to 10+ hours. It’s simple: Everyone in California will need to upgrade their driver’s license or ID card by October 2020 to meet federal ID requirements. The new Real IDs will be required at airports and federal facilities, even if you're only flying domestically (otherwise you'll have to carry your passport). The California DMV, which has been conducting this transition, has been under heavy scrutiny lately for its handling of this requirement. This includes the firing of the California DMV commissioner, an audit by the state, and news that the California DMV was issuing Real IDs incorrectly. Most recently, Governor Gavin Newsom ordered a “reinvention” of the California DMV. Every state in the country is going through a similar transition! For example, here’s a post on how to get your Real ID in 10 other states. Help spread the word and tell others. Encourage friends and family to consider planning their trip to the DMV soon. The lines will only get longer as we get closer to the deadline. Encourage them to book a Real ID appointment ahead of time and they’ll get a documents checklist as well as appointment reminders. A large fraction of people are turned away at the DMV due to incorrect or inadequate documentation since Real ID requirements are incredibly strict.